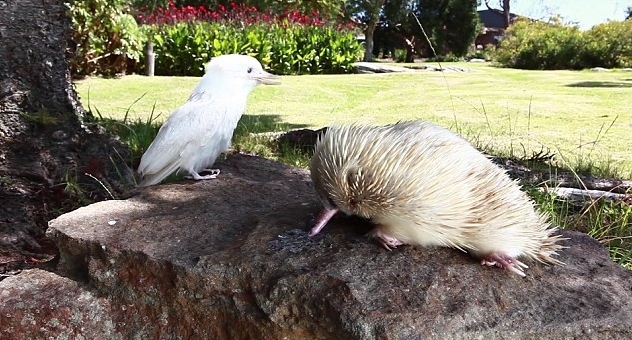 An unconventional friendship is blossoming between a rare white kookaburra and an albino echidna. The adorable footage released by Symbio Wildlife Park, in Helensburgh, NSW, shows Leo the echidna welcoming the new family member. Yet to be named, the kookaburra has a genetic condition called leucism which differs from Leo’s albinism that effects roughly one in 17,000 of any species. Both Leo and the kookaburra had a rough start before Symbio Wildlife Park became their home. The albino echidna was found orphaned in a carpark and needed to be nursed back to health before he was big enough to live independently in his own sanctuary. The kookaburra is believed to have fallen out of its nest before being found and placed in the care of Australia’s Wildlife Rescue Organisation, WIRES. Echidnas and the platypus are the only egg-laying mammals, known as monotremes. Echidnas do not tolerate extreme temperatures; they use caves and rock crevasses to shelter from harsh weather conditions. Echidnas are found in forests and woodlands, hiding under vegetation, roots or piles of debris. Echidnas evidently evolved between 20 and 50 million years ago, descending from a platypus-like monotreme. This ancestor was aquatic, but echidnas adapted to being terrestrial so they could live life on land. Responses to "Albino Echidna And Rare Snowy Kookaburra Strike Up An Unlikely Friendship"